Morocco was one of the most important centers of ketubbah illustration in the lands of Islam. Although scant written evidence attests to the importance of this practice in late medieval documents, certainly the custom gained growing popularity following the Spanish Expulsion. Calling themselves megorashim (exiled), the Sephardim who settled in Morocco insisted on enhancing the physical appearance of their marriage contracts early on, and carefully drew distinctions between their contracts and those of the local Jews, known as toshavim (natives). Invari- ably written on pieces of parchment, the Moroccan Sephardic ketubbot emphasize the elevated personal status of Sephardic women. Moreover, these ketubbot often contain a lengthy list of the male ancestors of the bridal couple, showing their roots and status, and calling on God to take revenge for their exile. The Braginsky Collection contract presents the art of the megorashim ketubbot of the coastal city of Essaouria (formerly known as Mogador), an impor- tant center of Sephardic activity at the time. The mercantile and cultural connections of the commu- nity with Europe are reflected in the elaborate, non-Islamic, decorative framework of the contract. Thus, familiar European designs such as gilt architec- tural elements and realistic flowers, reveal popular neoclassical origins. Moreover, in imitation of European status symbols, the first and last names of the bridal couple are alluded to in the intricate monogram designs appearing at center top and at bottom. Instead of using Hebrew letters, or even Arabic, they employed Latin letters. The top mono- gram, composed of the letters F R, apparently stand for the bride’s first name, Freha, while the R may allude to her European nickname (e.g., Renée). The four-letter monogram at the bottom, S L B F, obviously refers to the bridegroom: Solomon Levi Ben-Susan, with the addition of F for Freha. 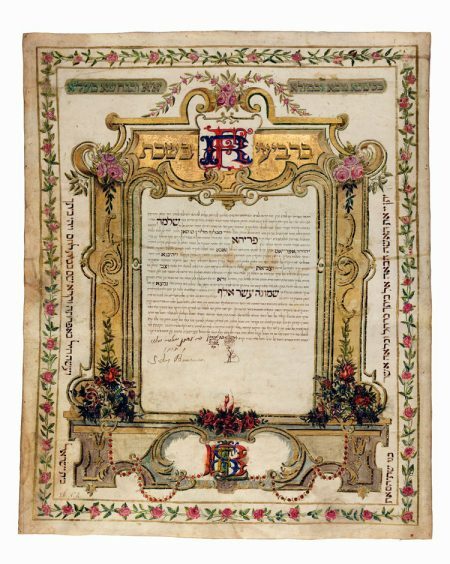 The ketubbah was decorated by the talented poet and folk artist David Nissim Elkäim, who was known by members of his community as “Leonardo of the Jews.” Elkäim, whose Latin initials D.N.E. appear at the bottom left, is responsible for many of the attractive ketubbot from Essaouria. His European- influenced designs even feature partial human representations, as seen here in the face of the winged cherub beneath the monogram at the bottom. Dowry: 13,000 Spanish doros; increment: 5,000 doros; total obligation: 18,000 doros.